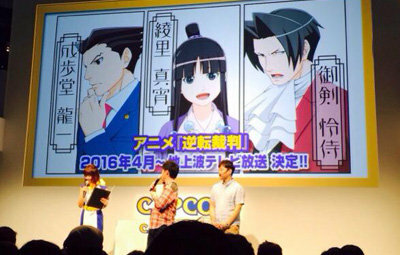 Capcom announced today that their popular Ace Attorney series will receive an anime adaptation! Details have yet to be announced, such as the animation studio, voice actors, or number of episodes, but the anime is set to premiere in April 2016. The anime will purportedly cover the original trilogy of games. The first three games initially released in Japan on the Gameboy Advance, with worldwide releases following on the Nintendo DS, and later the Wii and iOS. More recently the original trilogy was remastered for the Nintendo 3DS as a compilation title, Phoenix Wright: Ace Attorney Trilogy. While this is the first anime adaptation of the Ace Attorney games, Studio Bones created animated cutscenes for Phoenix Wright: Ace Attorney – Dual Destinies and Professor Layton vs. Phoenix Wright: Ace Attorney. The series has prior had manga adaptations as early as 2006, and even a live-action film in 2012.